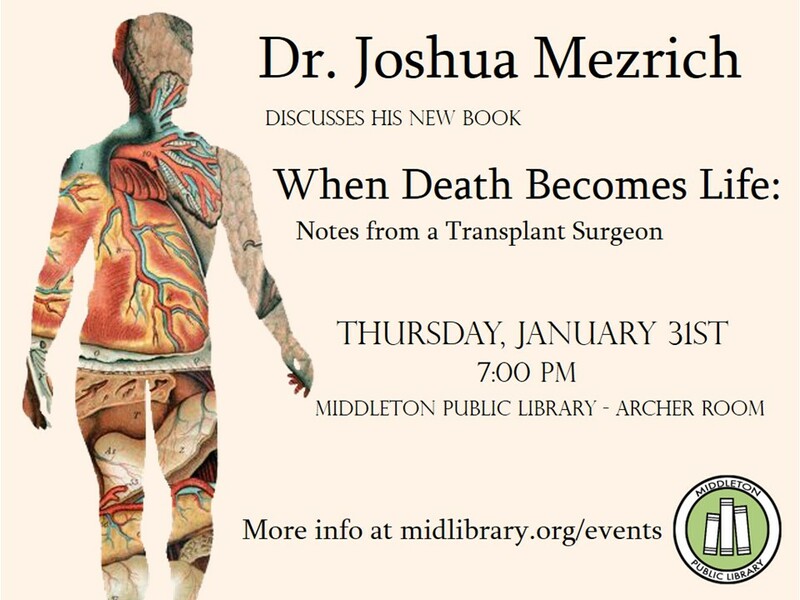 We are thrilled to welcome transplant surgeon Dr. Joshua Mezrich to the Middleton Public Library to discuss his new book, When Death Becomes Life published this month by HarperCollins. Mystery to Me bookstore will provide copies of Dr. Mezrich's book for sale at the event and the evening will conclude with a book signing. Registration is appreciated for this special author event: Online using the link above or by email at info@midlibrary.org From the publisher: "A gifted surgeon illuminates one of the most profound, awe- inspiring, and deeply affecting achievements of modern day medicine—the movement of organs between bodies—in this exceptional work of death and life that takes its place besides Atul Gawande’s Complications, Siddhartha Mukherjee’s The Emperor of All Maladies, and Jerome Groopman’s How Doctors Think. At the University of Wisconsin, Dr. Joshua Mezrich creates life from loss, transplanting organs from one body to another. In this intimate, profoundly moving work, he illuminates the extraordinary field of transplantation that enables this kind of miracle to happen every day. When Death Becomes Life is a thrilling look at how science advances on a grand scale to improve human lives. Mezrich examines more than one hundred years of remarkable medical breakthroughs, connecting this fascinating history with the inspiring and heartbreaking stories of his transplant patients. Combining gentle sensitivity with scientific clarity, Mezrich reflects on his calling as a doctor and introduces the modern pioneers who made transplantation a reality—maverick surgeons whose feats of imagination, bold vision, and daring risk taking generated techniques and practices that save millions of lives around the world."